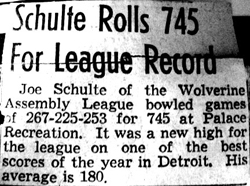 Joseph Francis Schulte was born on 7 November 1894 in Detroit, Wayne, MI, 4th son of Anthony and Wilhelmina (Knoche) Schulte. He received First Holy Communion on 19 September 1907 at St. Mary's in Detroit, an old Catholic Church with many German members. Joe began military service on 26 April 1918 in Detroit, MI serving as a wagoner for the U. S. Army in the 330th Field Artillery in the Great War. He ended military service on 26 April 1919 in Washington, D.C. Upon discharge, his character was cited as excellent. 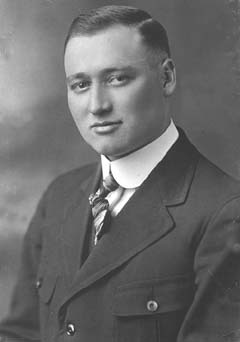 Years later he received notification of his award from the Amvets National Service Foundation, which proudly announced the enrollment of Joseph F. Schulte in the National Memorial Roster. Joseph was also a member of VFW Post # 3775 between 19 March 1944 and 3 April 1974. Joseph's headstone has a government marker and his widow was given a U.S. flag in honor of his military service. 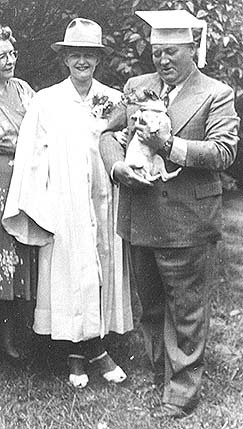 Joe married Sadie Mary Trombly, daughter of Alfred Columbus Trombly and Rose Susanne Rivard, on 7 September 1921 at Assumption Grotto Catholic Church in Detroit. His sister, Lidwina, and her brother, Eugene, were witnesses. Joe and Sadie had known each other from the time his family bought Joe Greiner’s farm property next to the church in 1908. During the 1920's and 30's Joe owned a gas station in Detroit at 11336 Gratiot. At that time he lived on Glenfield Avenue not far from Detroit City Airport. 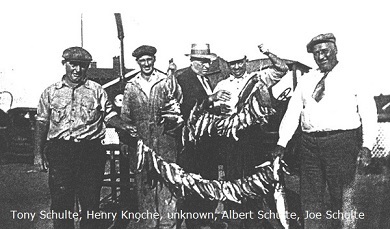 One day Joe Schulte and some buddies posed for a picture in front of Joe's gas station in Detroit holding a mess of fish they had caught. 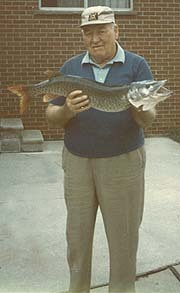 In later years he posed with other fish he had caught, including a large pike. Joe was a carpenter who built boats of all sizes for his own use and for others. The Schulte Boat Yard was in his garage in Roseville, the stationery noted "Expert Marine Engine Repairing." He named one of his cabin cruisers 'The Flying Dutchman' on which family and friends spent many leisurely Sunday afternoons. He also built houses, one of many was for his family in Roseville, for his daughter in Roseville, as well as one for a family in Grosse Pointe, MI along Jefferson Avenue. His handmade grandfather clock, from an old cherry tree, stood in the home of his grandson, Alan Jeske, for many years and is now in the proud ownership of great-granddaughter, Stephanie Pizor. Joe was a charter member of the Detroit Old Timers Association. It's purpose was to be a "non-profit, non-partisan, non-political organization of believers in Detroit dedicated to the preservation of the traditions of old Detroit and the friendships of old Detroiters; to further the advancement of a steadfast faith and civic confidence in the future of the City of the Straits; to promote those worthwhile accomplishments of organizations and individuals that make for a greater city and for the welfare and happiness of all citizens." It's headquarters was at 556 W. Larned St.
Joseph belonged to the Greater East Side Republican Club and was a member of the American Legion Club of Detroit for which he carried membership cards dated 1937. 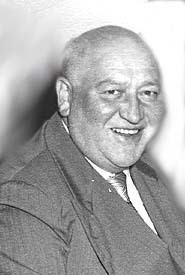 He was appointed a member of the Erin Township Planning/Zoning Board by the order of Probate Judge Joseph Trombly in the county of Macomb, serving from 1951 - 1957. Early Erin Township encompassed what later became the city of Roseville. 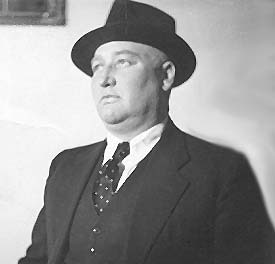 He was employed by the Port Authority of Detroit, MI as a Captain of Port beginning 23 June 1942. 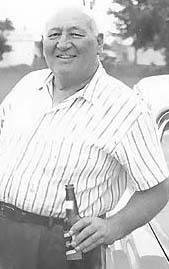 His daughter, Rosemarie, had a newspaper clipping of him when he was an investigator in a scrapbook. He had also worked at the Detroit City Airport, not far from his home on Glenfield, during the years of the Second World War. In January 1944 Joe received this signed note from then Governor Harry Kelly: Dear Joe, Enjoyed your Christmas greeting. May yours be the happiest of '44s. When Joe was a young man living on the Schulte farm in Detroit, his mother instilled a strong sense of duty in him to attend Mass and help the church. Every year back then he would clean the Isinglass in the base burner and the fireplace chimney for the Sisters of Assumption Grotto's parish. Elizabeth Lenhard, daughter of Joe's uncle, John Knoche, was the organist at St. Margaret's Church in St. Clair Shores where Joe and Sadie went to Mass every morning. She said she liked to play the hymns Joe knew because, "he sure could sing loud and clear." You could always find Joe by listening for his hearty laughter. He’d be in the group of guys, all with a beer in hand, sharing jokes and playfully teasing. When Sadie would join the senior citizen's group for events and invite him along, Joe remarked, "Ah, who wants to be with all those old people." If he was the one to answer the phone at Rosemarie's house when boys called for grand-daughter, Darleen, Joe would announce firmly, but with a chuckle to himself, "Wayne County Morgue." Everyone knew he was really a warmly loving man with a big heart. 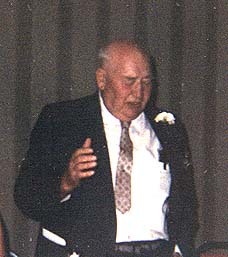 At his 5oth wedding anniversary party he looked much as he had on his daughter's wedding day (and his & Sadie's own 28th annv) sharing many humorous tales with family and friends. Joe had his first stroke early in 1974 and had been getting around at home with the aid of a walker, but then had a second stroke in late March. He died on 3 April 1974, a Wednesday, at Mt. Clemens General Hospital, due to cerebral thrombosis, at age 79. He was buried on 6 April 1974 at Resurrection Cemetery in Clinton Township. His wife, Sadie, and his brothers, Elmer and Edwin are beside him.